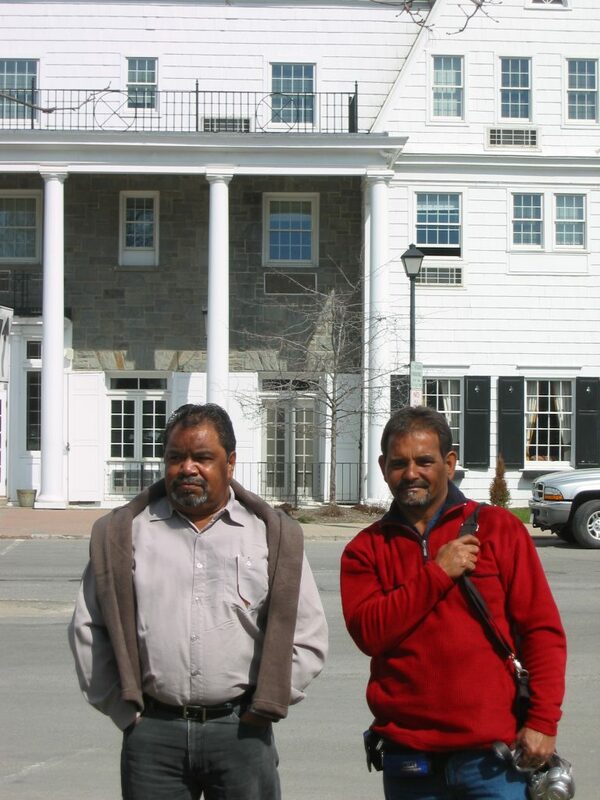 Ezzard Flowers and Athol Farmer (right) standing outside the Colgate University Guesthouse where they and John Stanton stayed when visiting Colgate University, Hamilton, New York State, 13th April 2005. Photograph taken by John Stanton. Berndt Museum of Anthropology, University of Western Australia. Athol Farmer comes from Gnowangerup, where there was a Mission up until the 1980s. It is now an Education Centre. Athol travelled to Colgate University with Ezzard Flowers and myself back in ’05, to inspect the newly rediscovered collection of Noongar child art from the late 1940s and early 1950s that had been donated to Colgate University by a Mr Herbert Mayer who had, in turn, purchased the artworks from Florence Rutter in London. 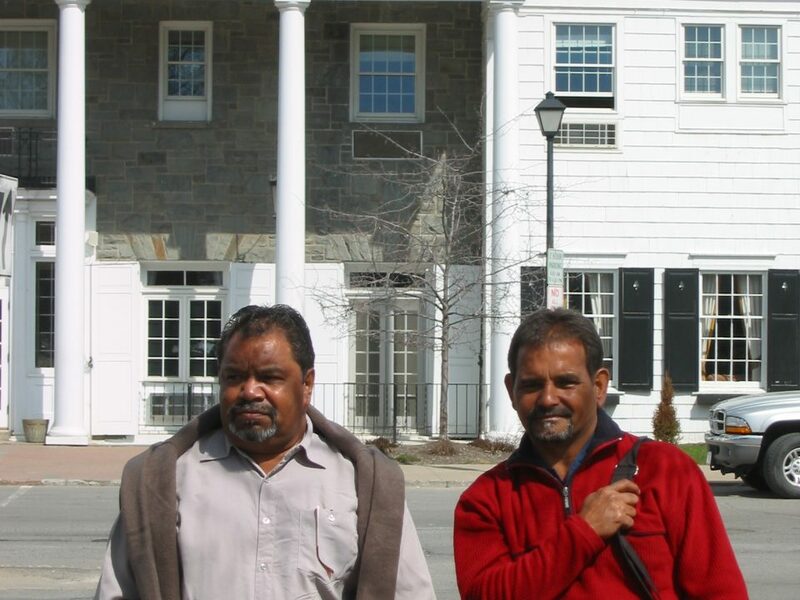 Both Athol and Ezzard were involved in setting up the Noongar Boodja Art Gallery in part of the old Shire Offices at the Katanning Town Hall, and this is why they came with me to Colgate, as I have outlined in a previous blog, A Long Way from Home. Both men have been staunch promoters of contemporary Noongar art in the South-West region; both have also been prime movers in the maintenance and assertion of contemporary Noongar identity and sense of self. Athol is a prominent Noongar artist in his own right, and has been inspired and strongly influenced by the Carrolup artists in his own art practice. This is quite clear: his landscapes draw on the Carrolup art tradition, but take it into modern acrylic media, often on a large and sweeping scale. In his own words, Athol’s art seeks to encapsulate the nature of Noongar country, it’s spiritual power and it’s enduring sense of place, and people. He has used his experiences engaging with country, through his art, to engage with younger Noongar people in their encounter with the land, with their families, and with themselves. He sees art as a healing medium, and its use in understanding and mitigating trauma and the profound sense of loss that many Noongar people feel (and other Aboriginal people from elsewhere, too, for that matter).